Whitetail Deer Hunting - From the trophy bucks in South Texas, and the big-bodied, heavy-horned bucks in the heartland states of Kansas, Iowa, Illinois, and Ohio and up into Alberta and Saskatchewan, Canada, we've put together a great selection of Whitetail Deer hunts, 165 in total. 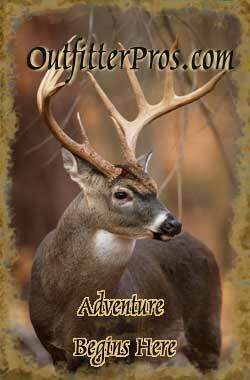 Whitetail Deer hunts from reputable big game guides and outfitters for that trophy room filling hunting experience. Guided and self-guided bow and gun Whitetail Deer hunts. Whitetail Deer Guide (Alces alces) The species is most common east of the Rocky Mountains, and is absent from much of the western United States, including Nevada, Utah, California, Hawaii, and Alaska (though its close relatives, the mule deer and black-tailed deer, can be found there). It does, however, survive in aspen parklands and deciduous river bottomlands within the central and northern Great Plains, and in mixed deciduous riparian corridors, river valley bottomlands, and lower foothills of the northern Rocky Mountain regions from Wyoming to southeastern British Columbia. The conversion of land adjacent to the northern Rockies into agriculture use and partial clear-cutting of coniferous trees (resulting in widespread deciduous vegetation) has been favorable to the whitetail deer and has pushed its distribution to as far north as Prince George, British Columbia. Populations of deer around the Great Lakes have also expanded their range northwards, due to conversion of land to agricultural uses favoring more deciduous vegetation, and local caribou and moose populations. The westernmost population of the species, known as the Columbian whitetail deer, once was widespread in the mixed forests along the Willamette and Cowlitz River valleys of western Oregon and southwestern Washington, but today its numbers have been considerably reduced, and it is classified as near-threatened. Whitetail deer are generalists and can adapt to a wide variety of habitats. The largest deer occur in the temperate regions of Canada and United States. The smallest deer occur in the Florida Keys and much of Central America and in South America. Deer from Central and South America generally have smaller tails and antlers. North American male deer (also known as a buck) usually weighs from 130 to 300 pounds but, in rare cases, bucks in excess of 375 pounds have been recorded. The record-sized Whitetail Deer weighed just over 500 pounds and was found in Minnesota. The female (doe) usually weighs from 90 to 200 pounds. Length ranges from 62 to 87 inches, including the tail, and the shoulder height is 32 to 40 inches. Males re-grow their antlers every year. Antlers begin to grow in late spring, covered with a highly vascularised tissue known as velvet. Bucks either have a typical or non-typical antler arrangement. Typical antlers are symmetrical and the points grow straight up off the main beam. Non-typical antlers are asymmetrical and the points may project at any angle from the main beam. These descriptions are not the only limitations for typical and a typical antler arrangement. The Boone and Crockett or Pope & Young scoring systems also define relative degrees of typicality and atypicality by procedures to measure what proportion of the antlers are asymmetrical. Therefore, bucks with only slight asymmetry will often be scored as "typical". A buck's inside spread can be anywhere from 3?5 in. Bucks shed their antlers when all females have been bred, from late December to February. Females enter estrus, also called the "rut", in the fall, normally in late October or early November, triggered mainly by declining photoperiod. Sexual maturation of females depends on population density. Females can mature in their first year, although this is unusual and would occur only at very low population levels. Most females mature at one or, sometimes, two years of age. Most are not able to reproduce until six months after they mature. Males compete for the opportunity of breeding females. Sparring among males determines a dominance hierarchy. Bucks will attempt to copulate with as many females as possible, losing physical condition since they rarely eat or rest during the rut. The general geographical trend is for the rut to be shorter in duration at increased latitude. There are many factors as to how intense the "rutting season" will be. Air temperature is a major factor of how intense the action will be. Anytime the temperature rises above 40 degrees Fahrenheit, the males will do much less traveling looking for females, or they will be subject to overheating or dehydrating. Another factor for the strength in rutting activity is competition. If there are numerous males in a particular area, then they will compete more for the females. If there are fewer males or more females, then the selection process will not need to be as competitive. Whitetails communicate in many different ways including sounds, scent, body language, and marking. All whitetail deer are capable of producing audible noises, unique to each animal. Fawns release a high pitched squeal, known as a bleat, to call out to their mothers. Does also bleat. Grunting produces a low, guttural sound that will attract the attention of any other deer in the area. Both does and bucks snort, a sound that often signals danger. As well as snorting, bucks also grunt at a pitch that gets lower with maturity. Bucks are unique, however, in their grunt-snort-wheeze pattern that often shows aggression and hostility. Another way whitetail deer communicate is with their white tail. When a white-tail deer is spooked it will raise its tail to warn the other deer in the area that can see them. In western regions of the United States and Canada, the whitetail deer range overlaps with those of the black-tailed deer and mule deer. White-tail incursions in the Trans-Pecos region of Texas has resulted in some hybrids. In the extreme north of the range, their habitat is also used by moose in some areas. Whitetail deer may occur in areas that are also exploited by elk such as in mixed deciduous river valley bottomlands and formerly in the mixed deciduous forest of Eastern United States. As most hunters know, they are smart and elusive and big bucks can be difficult to hunt. Whitetails are favored among sportsmen because they are abundant, accessible and a challenge to hunt. North, south, east and west, hunters of all ages pursue this magnificent animal each fall. Ready for that trophy whitetail deer hunt? Need a few relaxing days away from the rat race? If so, please continue reading to learn how Deer Haven Acres may be of service to you. This will be that once in a lifetime deer hunting trip. Located in rural and scenic Central Wisconsin, Deer Haven Acres can be best described as a place away from it all. Away from the city, traffic, and stress of everyday life. Deer Haven Acres hosts a 208-acre wildlife preserve that's home to a variety of wildlife, including whitetail deer, turkey, and other animals native to Southern Wisconsin. Guests at Deer Haven Acres can expect to see this wildlife in abundance while visiting. If you're in search of a trophy whitetail deer hunting, you're in luck! Deer Haven Acre's whitetail herd is managed to produce true trophies. Boone and Crockett class whitetail have been harvested by a number of former Deer Haven hunters. There's no reason why you can't have one as well! In addition to whitetail hunting, Deer Haven Acres provides hunters with the option to hunt various game birds. Turkey, pheasant, chukar, quail, and a few other birds can be hunted. Gun and Bow hunts in Texas, Kansas, Illinois, Missouri, Kentucky, Ohio, Alberta & Saskatchewan Canada, and more.